Evidence shows that there were Jews in Komárno in the Middle Ages, but modern Jewish settlement began only in the eighteenth century. Its fastest growth came with the rapid development of Komárno into an important urban center. In the space of 50 years the number of Jews almost tripled, from 849 (1850) to 2,296 (1900). After the 1869 congress that formally split Hungarian Jewry into three separate streams, the Komárno community joined the Neolog movement; a separate Orthodox community was established in 1880. The two communities used the same cemetery, which was split into two sections. Two community synagogues still stand today; the former Orthodox synagogue was integrated in the complex of a (non-Jewish) old age home. The Neolog Temple is used as a sport club. In 1941 there were 2,734 Jews in Komárno. They were deported to Auschwitz in 1944; only 248 survived. There is still an active Jewish community in the town, however. It serves today as an important trans-border center of Jewish religious and cultural life. One of the major events it sponsors is the local observance of the annual European Day of Jewish Culture, which attracts numerous visitors from Slovakia and Hungary. 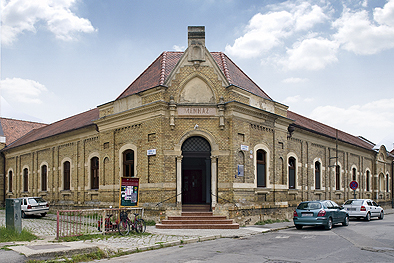 Today the center of Jewish religious and cultural life in Komárno, Menház is the compound, built in 1896, that comprises the former Jewish old age home and its synagogue. It is a single-story, L-shaped neo-Gothic complex with unplastered brick facades. It stands on a street corner, with the main entrance on the corner. The synagogue at the northern rear side of the Menház has a charming Gothic interior with its original furniture and highly decorative cast-iron tie bars. A Holocaust monument with a memorial book of Komárno victims stands at the northern wall. A few years the ago, the Community mounted two black Holocaust memorial plaques onto the synagogue façade. Visitors should not miss visiting the small exhibition on Komárno Jewish history located in the Jewish community office.